NOTE: You can't actually hear the words in question, but you don't have to be an ace lip reader to tell that the video clip below contains some fairly clear mouthing of obscenities. Reader/viewer discretion is advised. 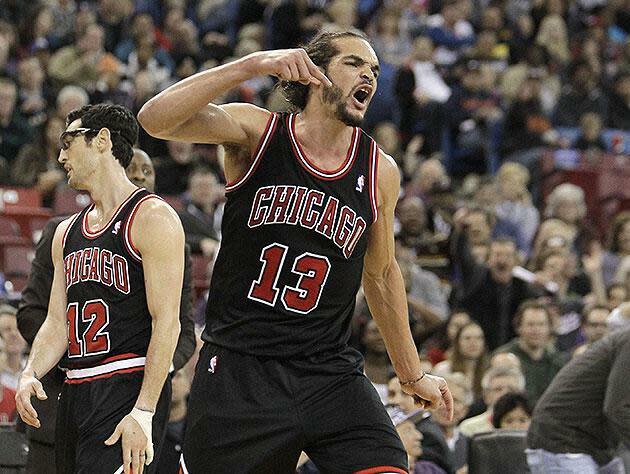 It's no secret that Joakim Noah's a fiery sort. His nonstop motor and relentless competitive streak has made him the easy-to-admire heart and soul of the Chicago Bulls for the last half-dozen seasons. All that passion can have a downside, though; sometimes the center's engine can overheat over perceived on-court injustices, leading to explosive (and regrettable) outbursts like the one that accompanied an early Noah exit against the Sacramento Kings on Monday night. Noah, who was locked in a physical battle with returned-from-injury Sacramento center DeMarcus Cousins and seemed to think he'd been getting the short end of the officiating stick since early in the contest, had already received a technical foul for complaining about a no-call during a second-quarter drive on which he felt he'd been fouled by Kings big man Jason Thompson. (He looked to have a legitimate gripe about that one.) With the Kings in the midst of a 21-10 run that put Chicago in a double-digit hole, Noah once again found himself on the business end of what appeared to be a weak loose-ball foul call while vying with Cousins for a rebound. He complained again, loudly, and the refs responded by hitting him with a second technical foul, triggering his immediate ejection. That's when things got interesting, and demonstrative, and vulgar. Noah's eruption — an individual f-bomb for all three game officials, complete with clear finger-points to each one — called to mind very not-suitable-for-work scenes from "Half Baked" and "Coming to America," combined with fellow emotional center Larry Sanders' sarcastic thumbs-upping of the zebras after getting the gate during a Milwaukee Bucks game last season. There wasn't any sarcasm here, though; just sneering and swearing to accompany a frustrating night that saw Noah finish with just four points on 1 for 6 shooting, four rebounds and two assists in 19 minutes as Sacramento blew Chicago's doors off, 99-70, behind big nights from Cousins (25 points, 16 boards, four assists in his return after six games on the shelf with an ankle sprain) and point guard Isaiah Thomas (19 points on 7 for 9 shooting). “I’m really disappointed,” Noah said. “I shouldn’t have acted that way. I apologize. I’m sorry to all three referees out there. They’re out there trying to do their jobs and I should never have said the things that I said. I hope they accept my apology and I hope I can move on from this. “I think I was just frustrated with the game. You gotta give Sacramento a lot of credit. They played really well, they deserve to win and we’ve got to step it up. I was frustrated with the call, but it doesn’t give me the right to do what I did. I deserve to get ejected, and it was just a bad decision on my part." I'm sure that Rodney Mott, Eli Roe and David Guthrie will accept Noah's apology — heat of the moment, water under the bridge/over the dam, and all that — but given the expletive-laden nature of Noah's exit, I'm guessing newly minted NBA Commissioner Adam Silver won't be quite so forgiving, making it likely that that the Bulls' big man will wind up being the first person to receive a fine (or, depending on how big a statement the new boss wants to make, maybe even a suspension) under Silver's regime. It's like my friend Earnest says: The speech might be free, but the bail costs money. Video via Beyond the Buzzer.